The Church of Jesus Christ of Latter-day Saints, often inadvertently called the Mormon Church, counted nearly 15 million members at the end of 2012. It is a global church, but small. The Church of Jesus Christ is unique, because it has a lay clergy. Service at every level is rendered on a volunteer basis. The Church provides a huge amount of material in many languages to support lay members in their service, which is coordinated on every level around the world. In areas where the Church is well-established, and has been for quite some time, members are experienced in church service, and know and understand how administration must be undertaken. Other areas of the world are emerging as members mature in their service and understanding of how things work in God’s kingdom on earth. Still other areas are just emerging, as new members in fledgling branches begin to serve and are instructed by missionaries and called leaders who oversee areas of the world. In April 2013 Elder Dallin H. Oaks visited the South Pacific to observe church progress and advise area leaders. His ancestors served Mormon missions in the South Pacific, so some of the Latter-day Saints he address when speaking there may have been descendants of members baptized by his great-grandfather. Within the region are found all three types of church progress. Australia and New Zealand have mature LDS congregations with experienced leadership. Samoa and Tonga display the rapidly advancing and modernizing Church of Jesus Christ. Papua New Guinea is experiencing the emerging version of the Church. The Area Presidency over the South Pacific must provide leadership that benefits all three. “The overall impression I have as I look back on 13 days in the Pacific Area, including visits to Samoa, New Zealand, and Australia, is to reaffirm in my mind that the strength of the Church is not Church headquarters; it’s out among the people. I have seen thousands of strong Latter-day Saints keeping the commandments, making the sacrifices necessary to send sons and daughters on missions and to serve missions themselves, paying their tithing, and fulfilling the responsibilities of their Church callings. Samoa gained its independence from New Zealand on January 1, 1962. 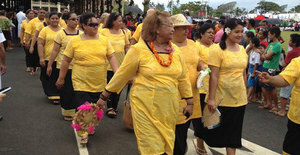 The first stake of The Church of Jesus Christ in Samoa was organized in Apia on March 18 of that year. There are 496,075 Latter-day Saints in Oceania, in 15 missions and 1,159 congregations. There are 10 Mormon Temples and 278 family history centers. This page was last edited on 28 July 2013, at 10:48.